ubuyfurniture.com has a remarkable accent chair collection that is sure to have the stylish seating you've been searching for. An assortment of upholstered chairs, exposed wood arm chairs and chair and ottoman sets have been gathered to create an accent collection designed to bring enhanced style, functionality and livability to nearly every room of your home. Classic shapes, contemporary finishes and even a few retro styles can all be found in this versatile collection. 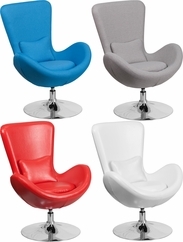 Our Accent Chairs ship FREE to the continental U.S. ,usually within 3-4 business days!